Please share your course review with us. Golf Guides USA does not necessarily endorse any of the ideas or statements made in the Reader Comments sections. However, we do publish those comments without filter, and the sentiments of our registered readers are reflected on every Public Course page as well as in our ordering of the Top 30. What we do guard against is publishing any comments that are mean-spirited and are not constructive towards measuring a golf course. We reserve the right to omit any commetns we deem unreasonable. We believe very strongly that every person is entitled to his or her opinion, and we also believe very strongly that as the publisher, we have the right to publish only the comments that are suited for this platform. 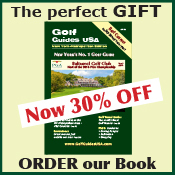 Golf Guides USA started publishing (printing) its one-of-a-kind golf directory for the NY-Metro Area since 1996 as a service that was as much self-serving as it was a business. Playing public golf in this area -- arguably the most plentiful in the country when it comes to quality courses -- can be overwhelming without a little help. So out came the book, ripe with descriptions and scorecards and phone numbers and fees, all to get the average guy out of the routine of playing his home course over and over again, and out into the wonderful world of golf that surrounds New York City. The book has now made the transition to the internet, and golfguidesusa.com is now here for all to enjoy. You Gotta Have Our Book !! !